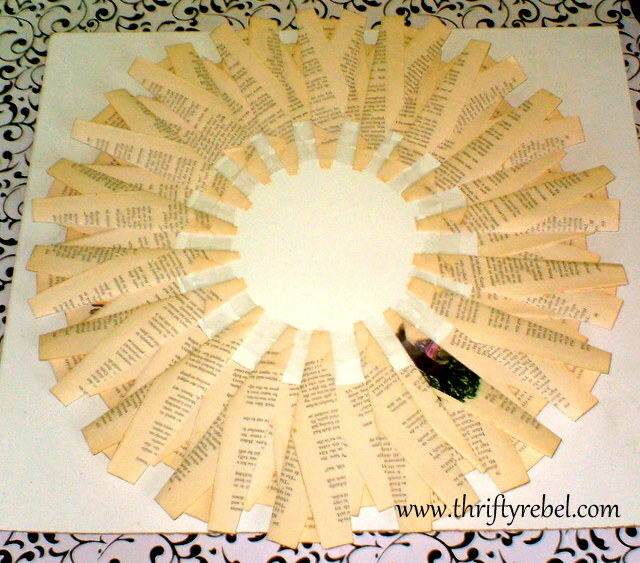 I’ve seen so many wonderful book page wreaths floating around blogland, and I’ve wanted to make one for a long time. 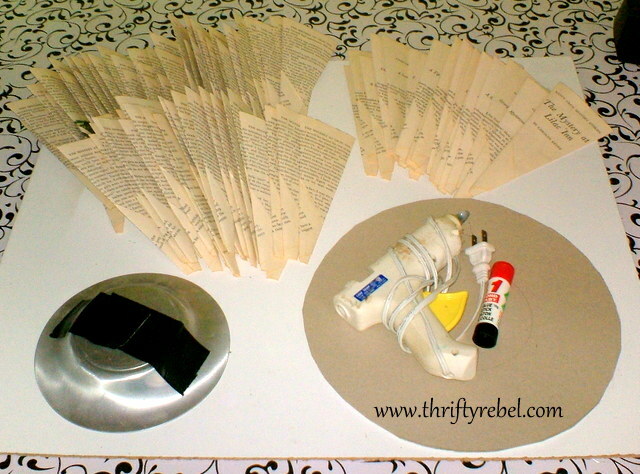 I haven’t been able to talk myself into taking a book apart… until now. 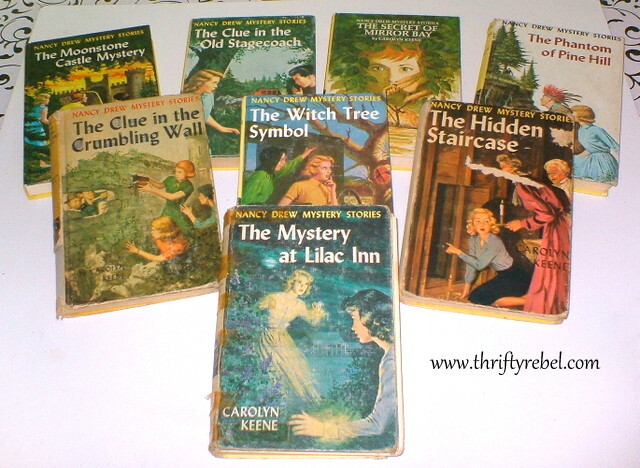 I’ve been a reader for as long as I can remember, and as a young girl I was totally enthralled by Nancy Drew. I remember many wonderful days spent with my friends making up our own mysteries, and acting them out with our barbie dolls. Such fun! 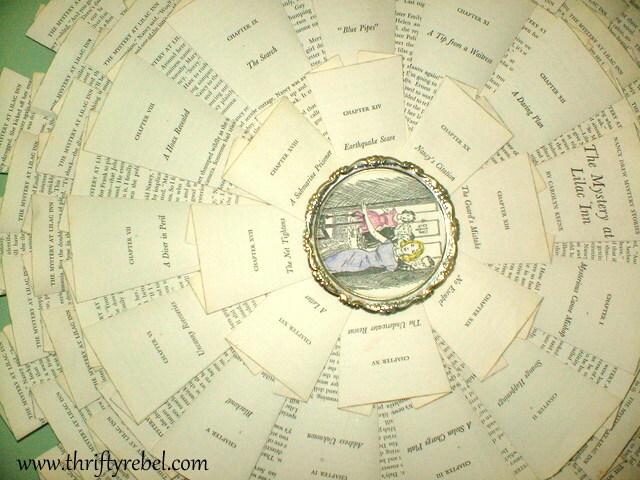 One thing I was sure of is that I didn’t want my book page wreath to be anonymous so after giving it a lot of thought I chose a book that meant something to me, a book from my childhood. 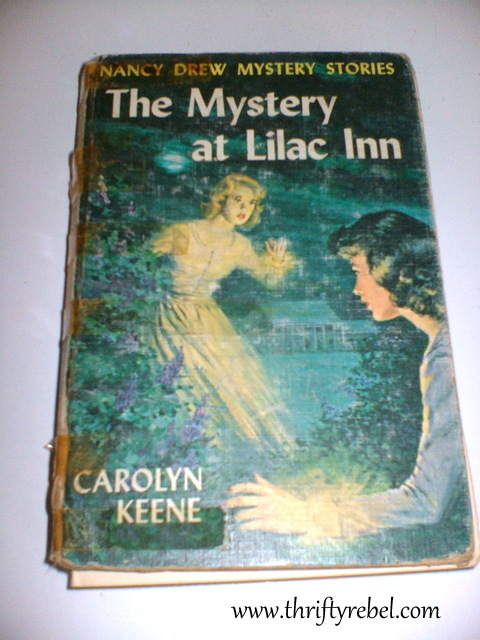 This version of ‘The Mystery at Lilac Inn’ was published in 1961, the year I was born. 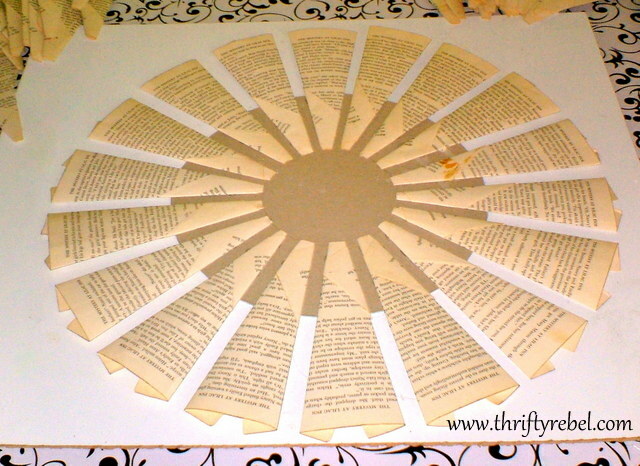 Because of its terrible condition, it was just perfect for this book page wreath. The pages had a lovely aged patina. Here’s a pretty stylish Nancy, totally rocking that purple dress. 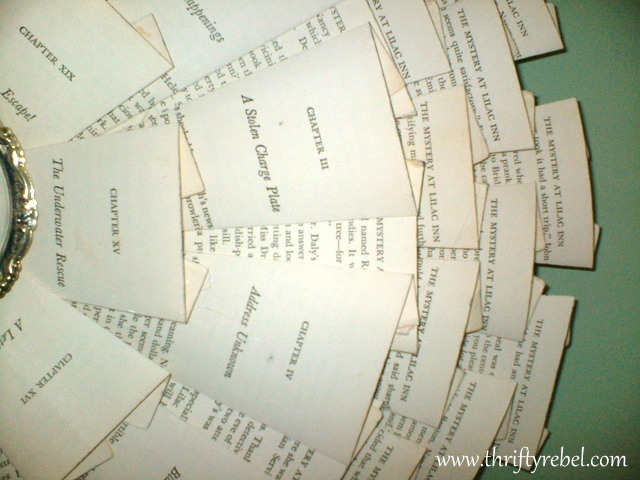 I rolled each page so the title of the book was at the front. I made sure the title was in the centre. 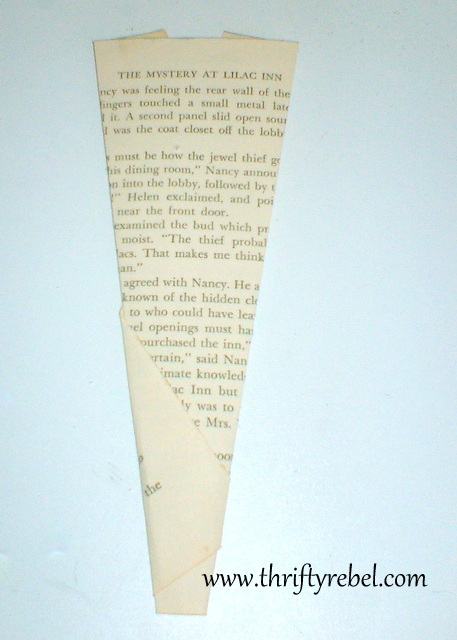 Then I pressed down the sides to flatten the triangle, making sure to centre the title as best I could. I used the glue stick to glue the little flap on the back. 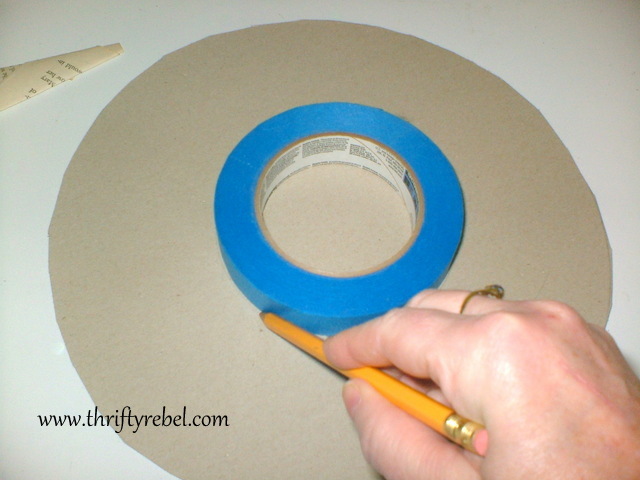 I cut a 12″ cardboard circle and measured where I wanted my triangles to start. I found that my roll of painters tape fit perfectly so I could pencil mark my starting place. This way all the triangles would be even. I glued my first row of triangles on to the cardboard circle. First I did a dry fit with the second row to see how far apart the triangles in the first row had to be so the second row triangles would fit nicely between them. 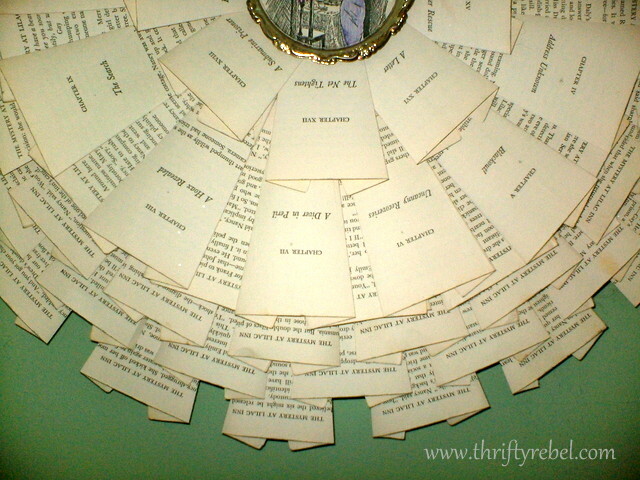 Then I glued on the second row, just beneath the book titles of the first row triangles. 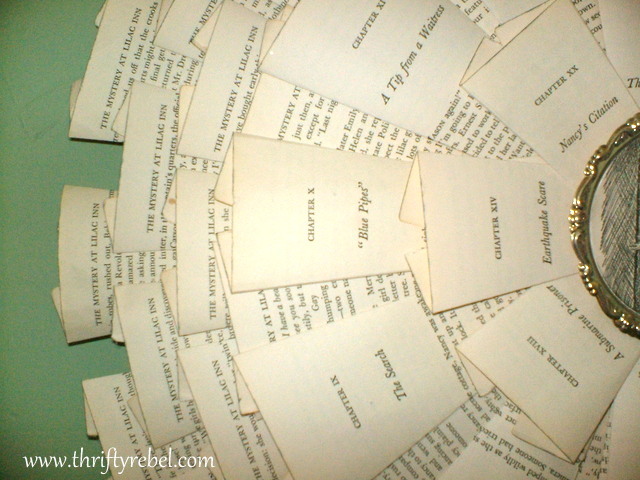 Then I glued the book title page triangle at the top of the third row, and chapter triangles 1 through 12, just beneath the book titles of the second row triangles. Then I tucked some triangles in between these pages to fill in the gaps. At this point I counted how many page triangles I had left, and I had enough to put a row around the back of the wreath. Then I cut a small hole in the centre of the cardboard and attached the wreath to the lazy susan that I had left over from this clock project. 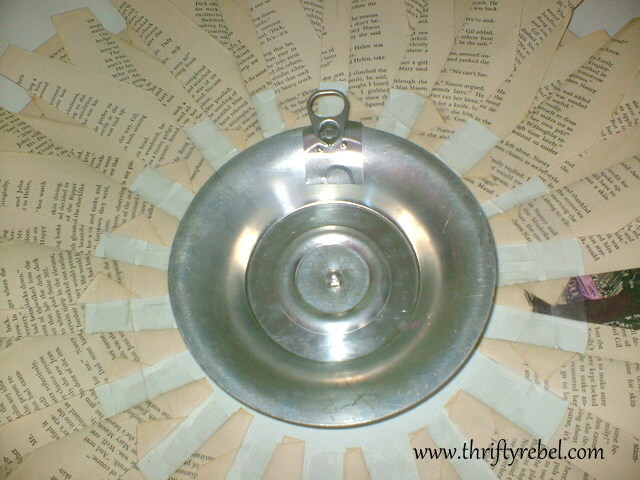 I cut the hanger from a cat food can lid and glued it on. 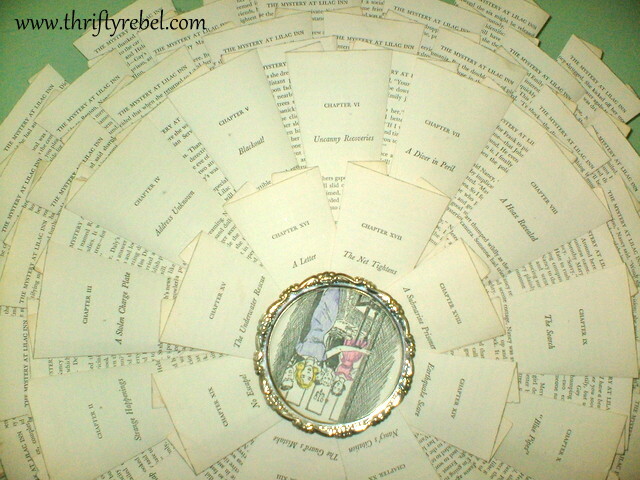 I used a slightly tarnished silver plated coaster to frame the illustration for the centre of the wreath. 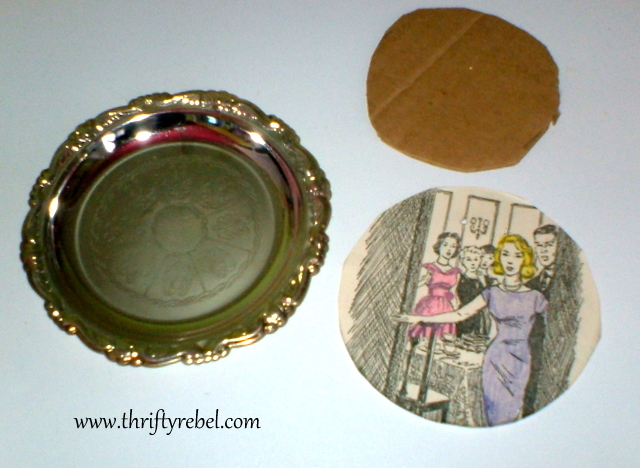 Then I simply glued the round piece of cardboard on to the coaster, and glued the illustration on to the cardboard. 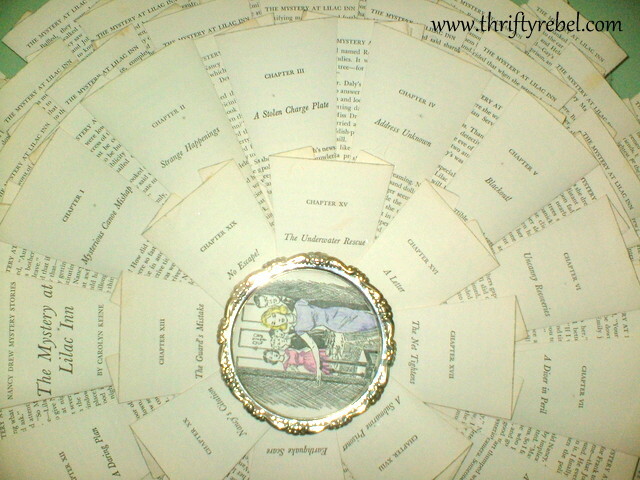 I added the triangles for Chapters 13 through 20, making sure to keep the previous chapter titles visible. I had to cut these triangles a bit shorter so they would fit. Then I glued the coaster to the centre of the wreath. 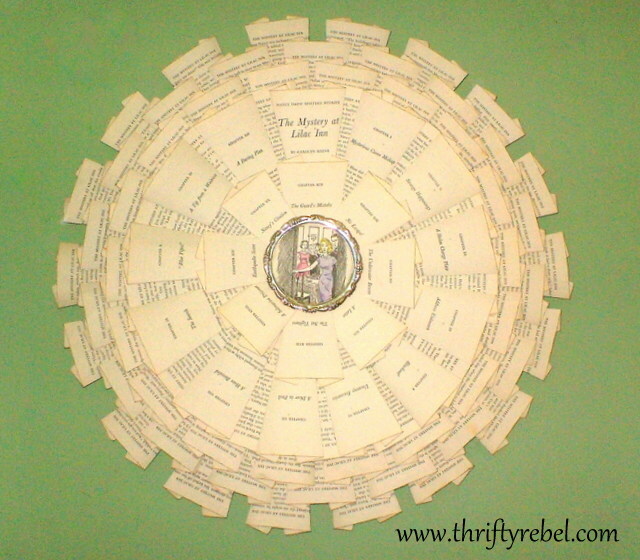 The lazy susan allows me to turn the wreath while it’s on the wall so I can read all the chapter titles whenever the mood strikes me. It wasn’t easy for me to take a book apart, but I wanted my wreath to mean something to me and I’m just thrilled to have a book from my childhood on constant display for me to enjoy. This treasured book was in terrible shape, and now it has a place of honour in my home. 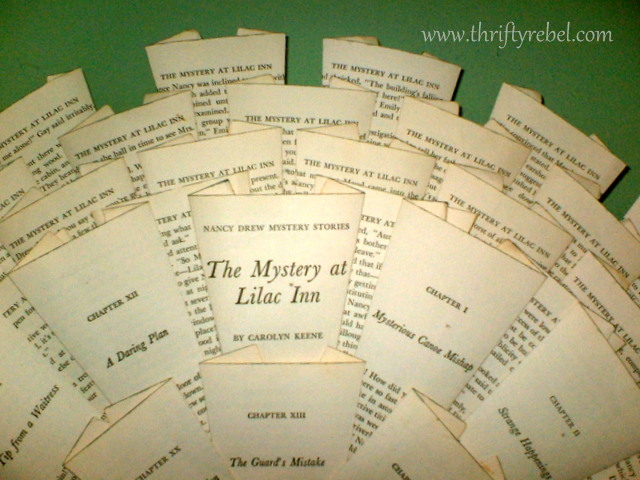 UPDATE: After making this project I found a copy of ‘The Mystery at Lilac Inn’ in much better condition so I now have it in my collection again. Tuula that is beautiful, I love that you have used a favourite book. Fun! 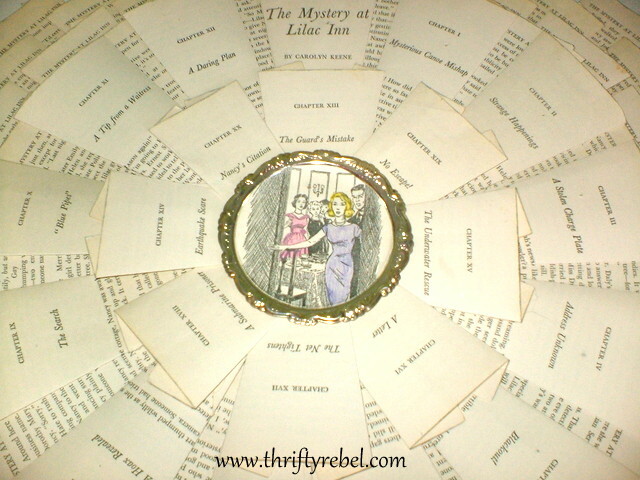 Your Nancy Drew wreath is awesome, Tuula! All the pictures bring back wonderful memories of childhood! The wreath is beautiful and neatly done. I've seen a lot that end up looking rather messy either because they weren't folded evenly or spaced poorly. Yours look perfect and I love that!!! Hmmmm..so Suzan is bossing people around in the blog world??!! I'll be speaking to her about that! I'm glad you listened though because this is one awesome wreath! 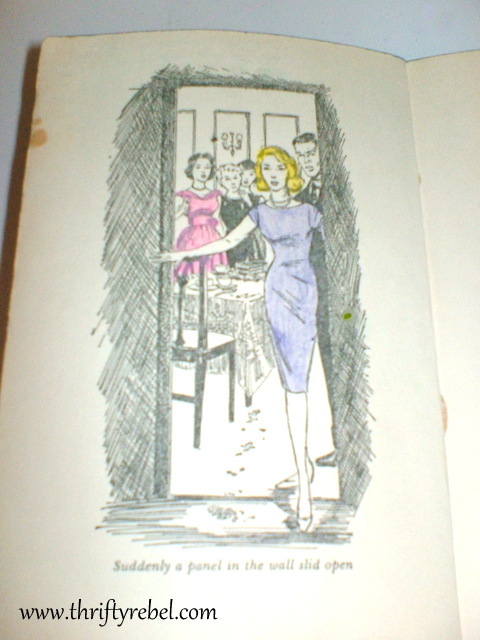 Love that it's from Nancy Drew and I really love that you smashed the cones flat. Such a unique look! Great project Tuula! Well Tuula, you've done it again!!! This takes me back – love seeing the books again – but where oh where is the Mystery of the 99 stairs???? I'm just going to call you Tuula the Wreath Maker from here on in – really – wreaths are your specialty! It's just gorgeous – and personal – and I absolutely LOVE it!!! 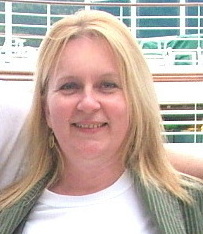 I was busy following Suzan over to play with images and you were busy being the clever, creative person you are! There is no mystery of why all of us love your wreaths, but this one surpasses any I have seen. 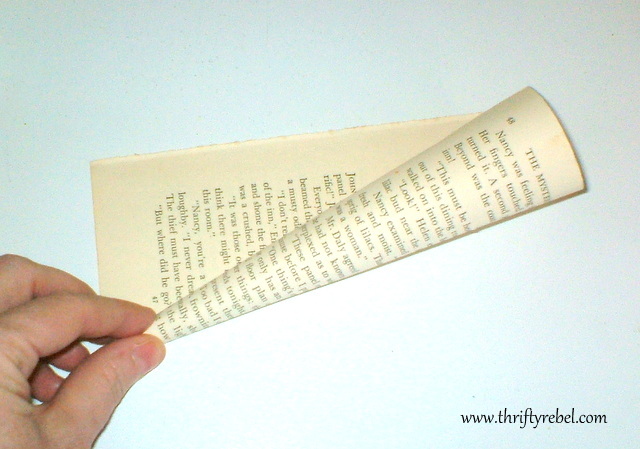 How awesome that you carefully folded each of those pages just right! I am pinning this, but you are the true master. 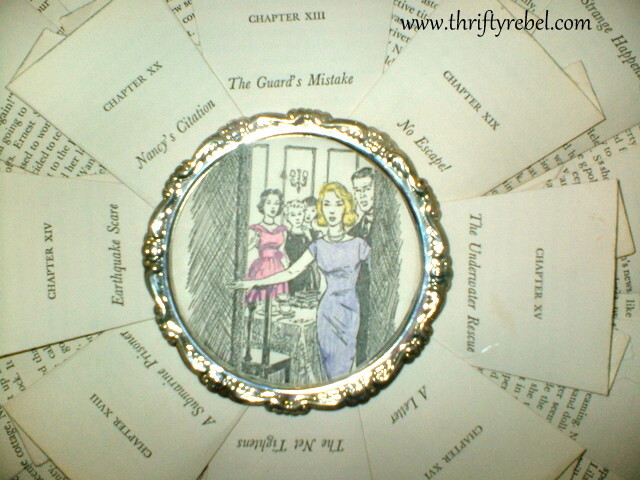 Nothing cuter than a Nancy Drew book wreath!! Thanks for sharing with all of us at NTT. this is amazing! I have never seen one like this. GREAT job! 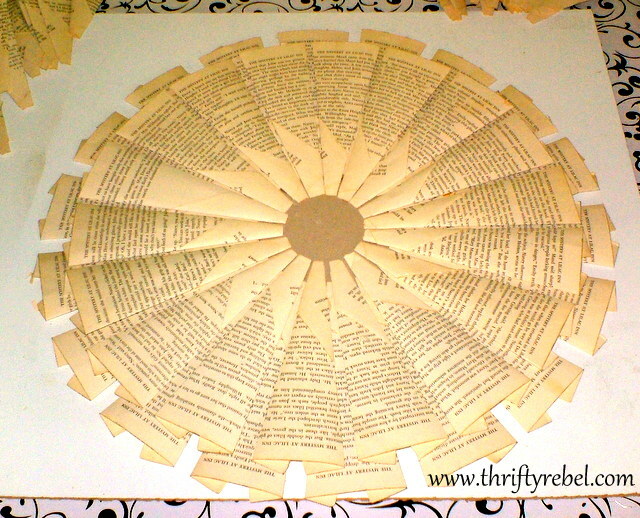 I read every one of those books and I love your wreath! Centring the chapter titles is brilliant. Pinning. LOVE this! 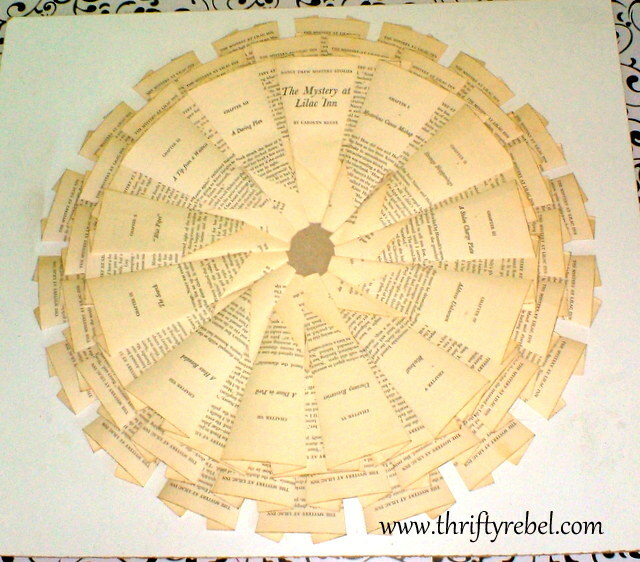 What a fabulous spin on the music/book/map wreath. 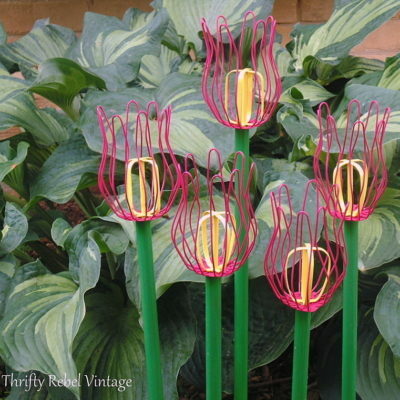 As soon as I find a second copy of Red Gate Farm I'll be making one of these for sure! This is really more a piece of art than just "another wreath". I like that it actually means something to you and brings back a memory. It makes it more special! Great job! What a gorgeous wreath! So pretty and meaningful. i love it!!! The lazy susan tip is brilliant! What a beautiful wreath. I love that you used a book from your childhood…well, not the actually book since it's a mystery what happened to it :). 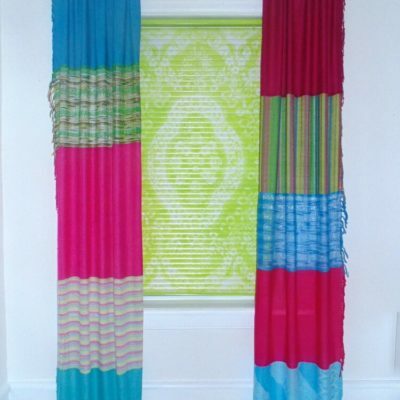 What a beautiful project and funny post. Great idea and project. 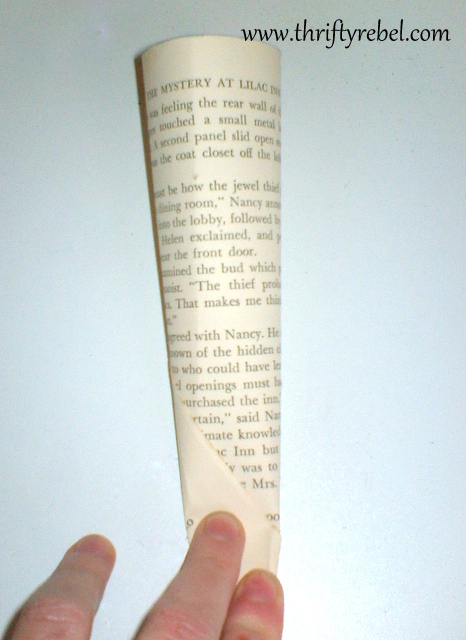 I would never have the patience but I grew up reading Nancy Drew though I do hate to see a book destroyed as a teacher.